I should learn not to speak too soon! This blog thing is not as easy as I thought! I will get into a posting routine I am sure, but I found myself with complete writers block the last few days. So my plan to post everyday idea has already failed. I think partly because I was very excited about two of our very great friends from yorkshire coming to stay with us. They have now been and gone – and my mind has re-focussed a little. I think my writers block was also down to the fantastic weather we have had in the UK the last week and I just couldn’t bring myself to stay inside and write. Has anyone else thought how odd it is to be out in summer clothes and flip flops given that half the leaves from the trees are on the ground? I also said in my last post that I was going to write about the think aloud technique, but I have just decided to write a conference abstract on it, so I will write that post later on with a link to the abstract (and eventual presentation) if it gets accepted to save repeating myself. So what to write about instead? 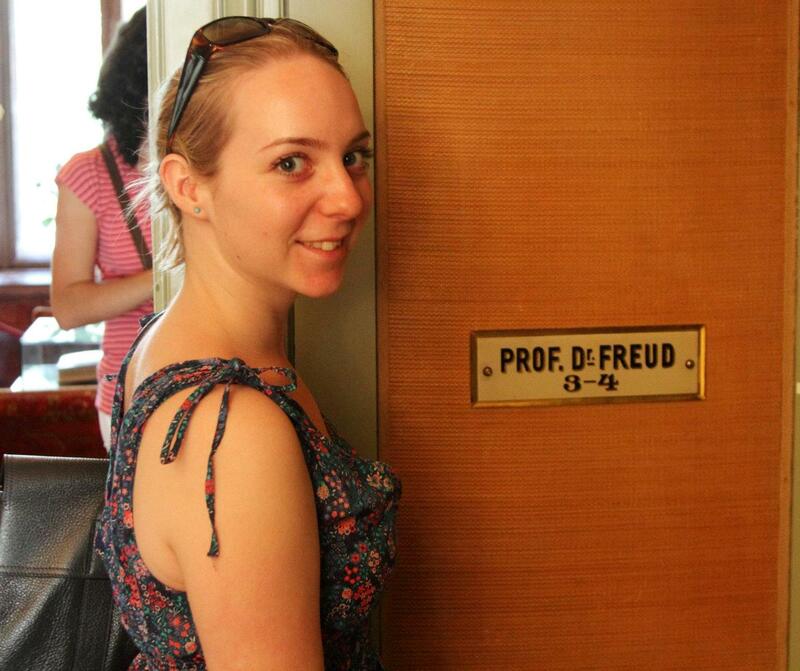 Well one thing I was quite excited about was that I unexpectedly got to visit the Freud museum in Vienna in July. I hear there is one in London too, but I have never been to that (although it is now on my list of things to do next time I am in London). Anyway, I have to admit, my knowledge on Freud and psychoanalysis is rather sketchy, it is not a field I have studied in any great depth, mainly because I am not involved in the therapeutic side of psychology and the bulk of psychologists working in academia (that I have encountered in my studies at the Universities of Birmingham and Bristol) do not teach Freudian theories. In fact the last time I remember learning about Freud was during my psychology AS Level. Despite my lack of knowledge of Freud’s work, it is hard not to be intrigued by a man who has had so much influence on the field of psychology especially the therapeutic disciplines and of course other fields like psychiatry. The great thing about this museum is that it had a fully stocked library with all the references on psychoanalysis that you could ever want (in several different languages – what a treat for people studying psychology). However, as this trip was made during our honeymoon (I have a very understanding husband) I didn’t look through all that material. What I did see was a brilliant timeline of all Freud’s achievements, the people he worked with the major events in his life outside work and with his family. What an amazing life he had – the people he worked with and met! I also realised on reading more about his work and life, that he had been greatly involved in the early studies of agnosia and aphasia. I hadn’t come across his work, in this area – which is maddening considering the year I dedicated to studying psychology and agnosia and aphasia are two large topic areas in this field. So this got me reading some more and I remembered a special issue in the Psychologist that I had read in 2006 linking Freud’s concepts to current neuropsychology and neuroscience. In this special issue I re-read Prof Mark Solm’s article in this special issue and found out there is a research group called Neuropsychoanalysis that have been going long enough to have their own journal (see: http://www.neuropsa.org.uk/). The thing is I don’t know what to make of all this. I haven’t started to read the material on the neuropsa website yet. I am sure there are links between Freud and Neuropsychology – but are they really that extensive (or extensive enough for a whole research group and regular journal articles)? I am going to have to read more and find out – but I am slightly scared that I might agree with them…which would be a massive re-evaluation of my standpoint on all things psychological. On a slightly less serious note I was also massively jealous that Freud had a framed certificate for his membership with the British Psychological Society. Things just aren’t the same nowadays. We (the graduate members) get a card (like a credit card). Anyway! Here I am at the Freud museum. I can highly recommend it if you are in Vienna its only just outside the main city centre and its not a big museum, you could get lost in the books for days, but otherwise it is a good 1-2hr distraction. My thoughts on Freud and Neuropsychology will be continued!